Learn More About the Healthcare Contract Management Software that Will Make Your Life Easier! 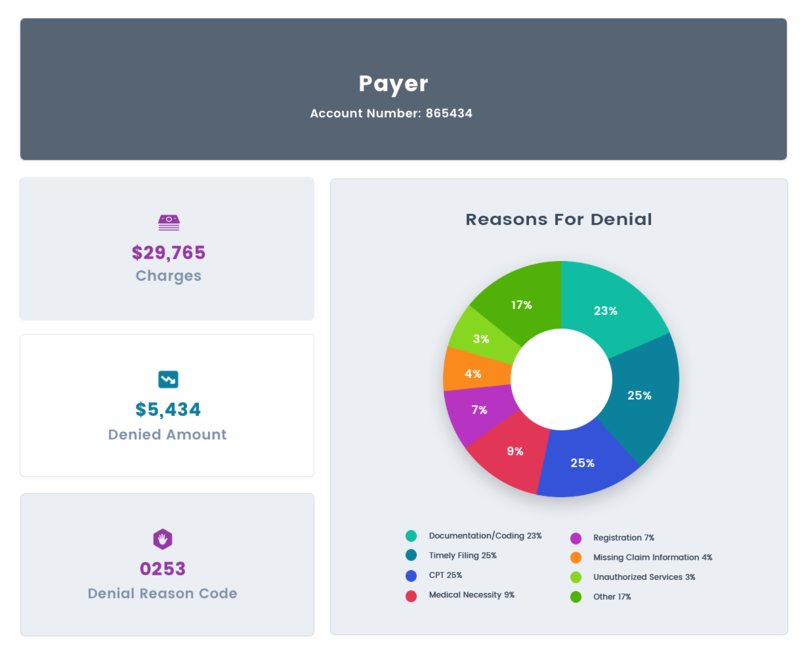 Healthcare payer contract modeling and management with claims management to identify and overturn underpayments and denials within any HIS system and model any contract. Take back the money you have earned with our state-of-the-art revenue recovery program. Identify and overturn wrongful denials. Save time by cutting down appeal time by two-thirds. Invisible vs. remit denials can only be identified by contract modeling. Simulate contracts with ease to compare newly proposed contract terms vs. existing contracts for win/lose analysis. MS-DRG Pre-billing Risk Analysis to Uncover Coding Compliance and Revenue Integrity Provides a narrative description that guides coders on the reason a claim was flagged. Revenue Masters offers integrated healthcare payer contract modeling and management services at 20 percent of the cost of other software. 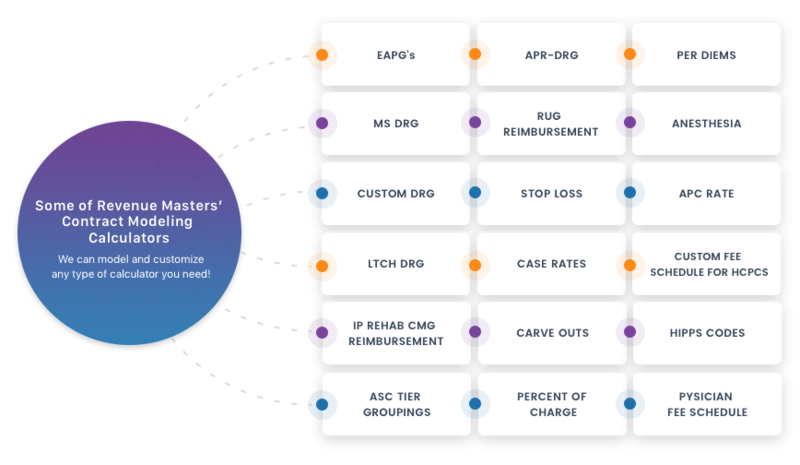 Revenue Masters is the most modern, powerful, accurate and affordable healthcare contract management software, all while being the undisputed price performance leader. Our healthcare contract management and modeling products work with any patient accounting system. Our system is cloud-based, HIPAA compliant, easy to setup, and active in as few as 30 days. It also has single and bulk appeal management features for workflow. Revenue Masters healthcare contract management software offers a simplified way to identify and overturn wrongful underpayments and denials. 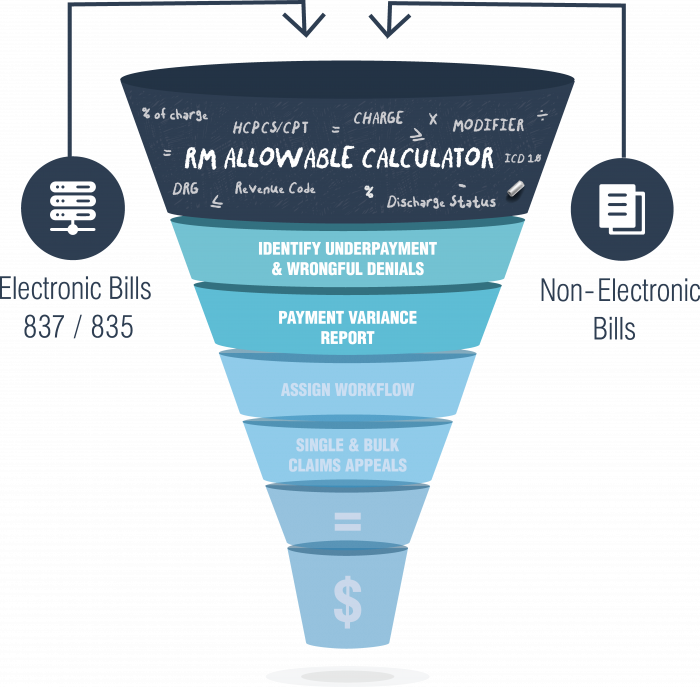 You can generate on-demand, detailed Payment Variance reports that compare the expected plan allowable to the amount that was paid by the payer — whether it was billed electronically or by paper. 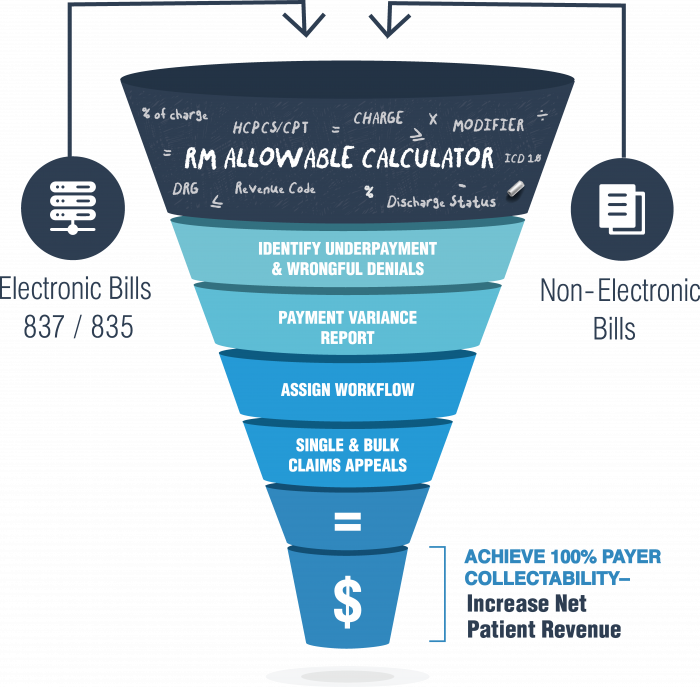 Keep your current claims management workflow while adding auto-calculated underpayments and denials to boost your net patient revenues. Revenue Masters handles all contract modeling, updates, rate tables and more. 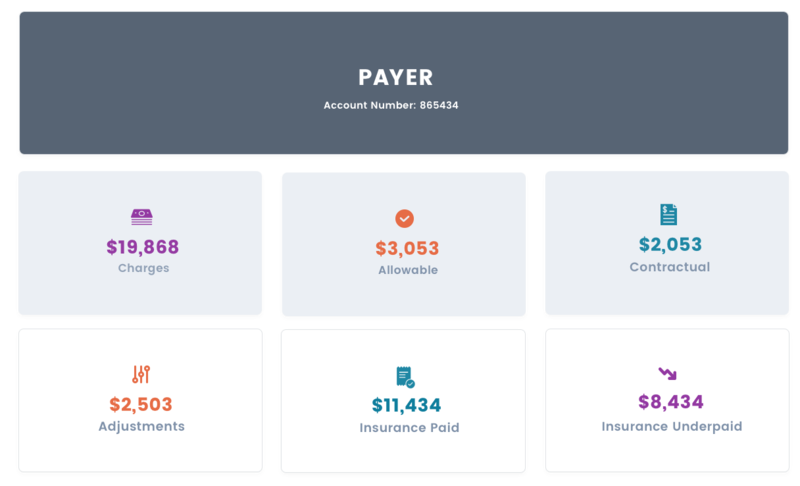 Our powerful calculators pre-calculate the expected payer reimbursement and compare that amount to the payment processed by the payer. We built our calculators to accommodate all types of complex reimbursement rates and have incorporated various qualifiers per calculator. Have a special contract calculator need? We will build it. 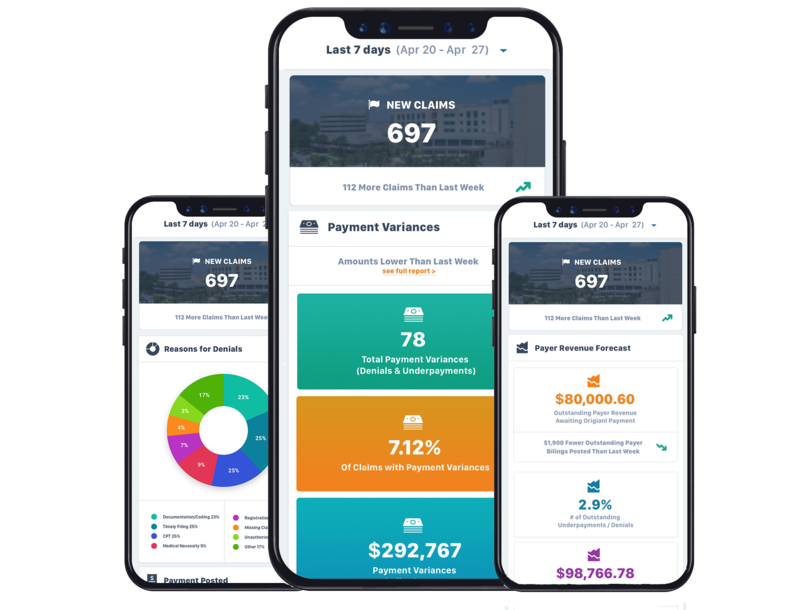 We also offer additional optional functionality for full claims management with the RM Reimbursement Maximizer™ for needs management, workflow assignment, custom reporting, financial forecasting and more. According to MGMA, payer underpayments total an estimated 7-11% of providers' net revenues. This money is lost if it cannot be identified and captured. Know what you should get paid with combined payer contracted rates, contractual language, EDI billing data, and remit data to quickly determine if the payer paid the correct amount. No longer spend time researching claim by claim looking for underpayments or using clunky old systems. Have the peace of mind you are fully identifying and collecting on all underpayments. Gross-to-net expected reimbursement forecasting is a significant challenge many providers face today. Due to multi-channel transactions and variances within pricing and payer contracting, providers often struggle to properly manage data and determine reasonable and supportable revenue forecasting. With our customized payer calculators, we are able to net down each claim by payer for each service immediately after the claim is billed. We provide NET revenue forecasting per payer, either detailed or summarized to assist providers in tackling and managing net revenue. Revenue Masters Cloud Contract Management system can easily simulate payer contracts and their financial impact on proposed payer rates when renegotiating contracts. We start with the existing reimbursement rates and terms, then modeling proposed contract profiles for comparison using a “copy contract function". Our “copy contract function” tool allows users to easily create various modeling “what-if” scenarios - making it easy to compare and catch rate changes you may have otherwise missed. The system provides the ability to simulate inpatient, outpatient and physician terms to determine the full financial impact. In addition, there is the ability to create user-defined historical modeling data sets using your claim history. Use the contract comparison tool for contract negotiations to determine if the proposed contract variables will increase or decrease net patient revenues. RMValidate is a cost-effective cloud-based application to assist healthcare providers in detecting missed revenue opportunities, potential coding compliance errors, and reduce costs of incorrect original billing. RMValidate intelligently analyses pre-billed MS-DRG based on predetermined qualifiers, automatically flags claims that have a likelihood of MS-DRG validity, either missed revenue integrity opportunities or potential coding compliance concerns, and provides a narrative description that guides coders on the reason the claim was flagged. By addressing root causes behind your coding challenges, RMValidate can improve billing practices, pinpoint educational opportunities for coders and clinical documentation improvement specialists, and accurately reflect patients’ clinical complexity. 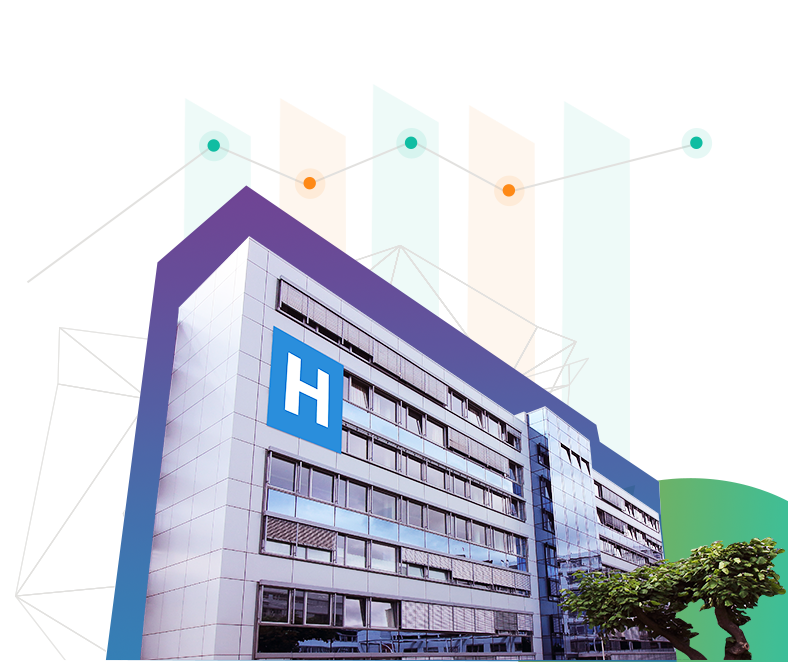 Inpatient coding is one of the biggest and most important areas when it come to a hospital’s coding compliance policy! Step 1. You provide to us your payer contracts, we model them into the software and import your 835/837 files and non-electronic bills. Step 2. RMCloud Contract Management identifies your denials and underpayments. Step 3. RMCloud Contract Management retrieves a payment variance report. Step 4. We can automatically assign your workflow for denials and underpayments management. Step 5. Collection staff can perform both single and bulk appeals. Step 6. Our state-of-the-art, powerful software will increase your net patient revenue! 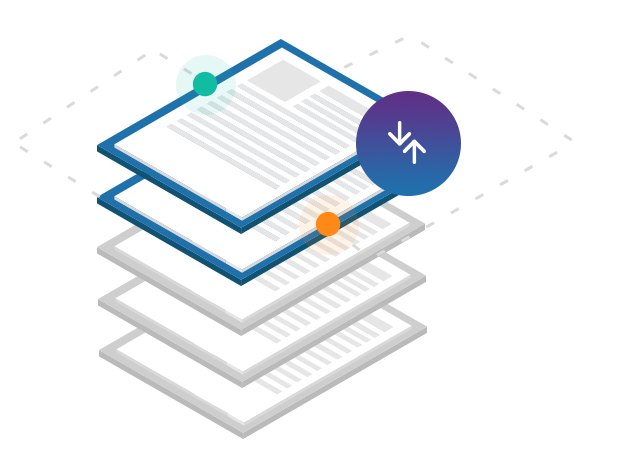 Partner with us for better contract modeling that accurately assess, measures and captures all revenue owed per your contracts.